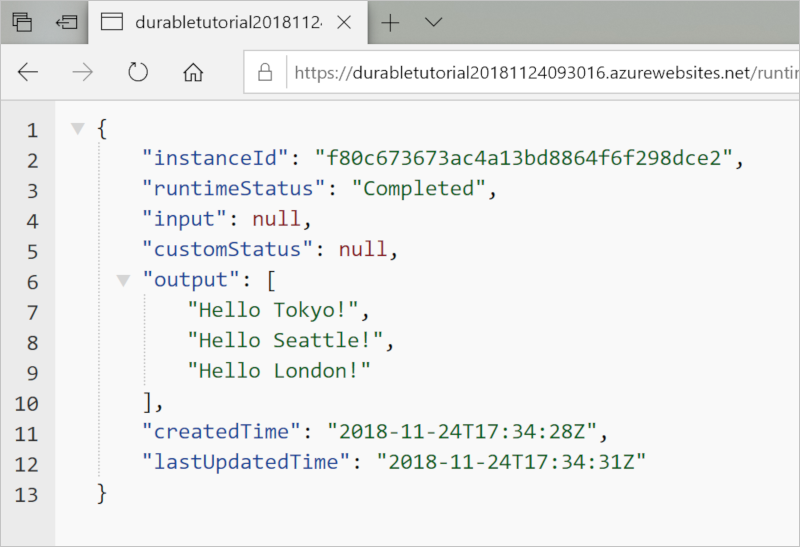 Durable Functions is an extension of Azure Functions that lets you write stateful functions in a serverless environment. The extension manages state, checkpoints, and restarts for you. 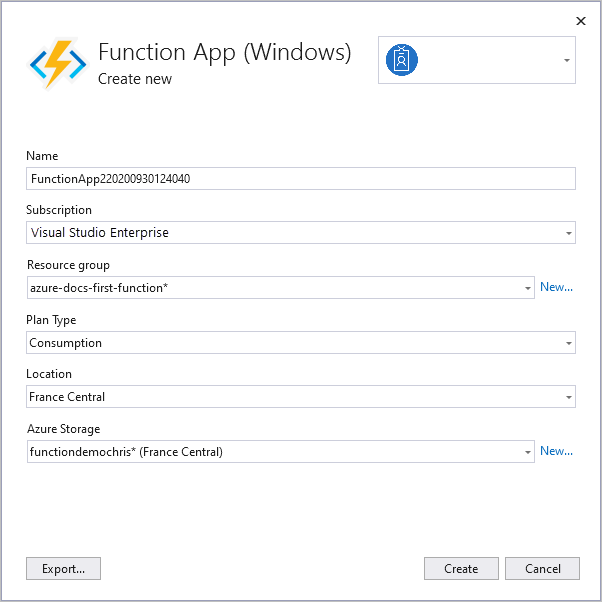 In this article, you learn how to use the Visual Studio 2017 tools for Azure Functions to locally create and test a "hello world" durable function. This function orchestrates and chains-together calls to other functions. You then publish the function code to Azure. These tools are available as part of the Azure development workload in Visual Studio 2017. Install Visual Studio 2017. Make sure that the Azure development workload is also installed. Verify you have the Azure Storage Emulator installed and running. 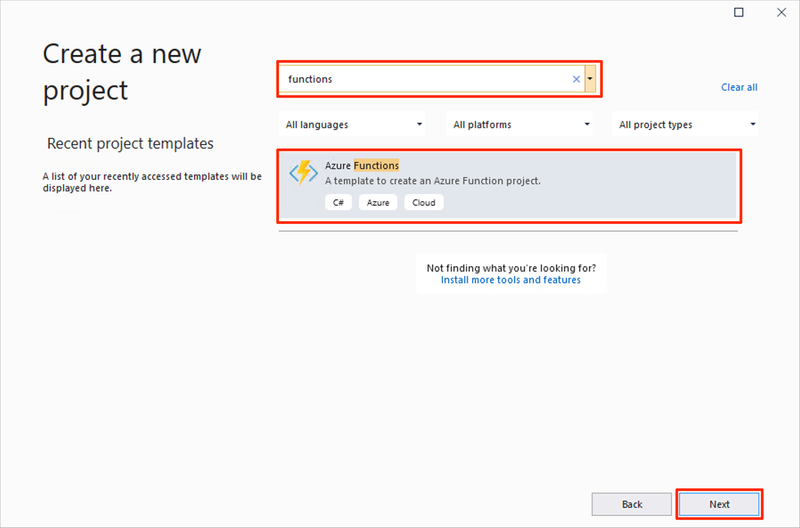 The Azure Functions template creates a project that can be published to a function app in Azure. A function app lets you group functions as a logical unit for management, deployment, and sharing of resources. In Visual Studio, select New > Project from the File menu. 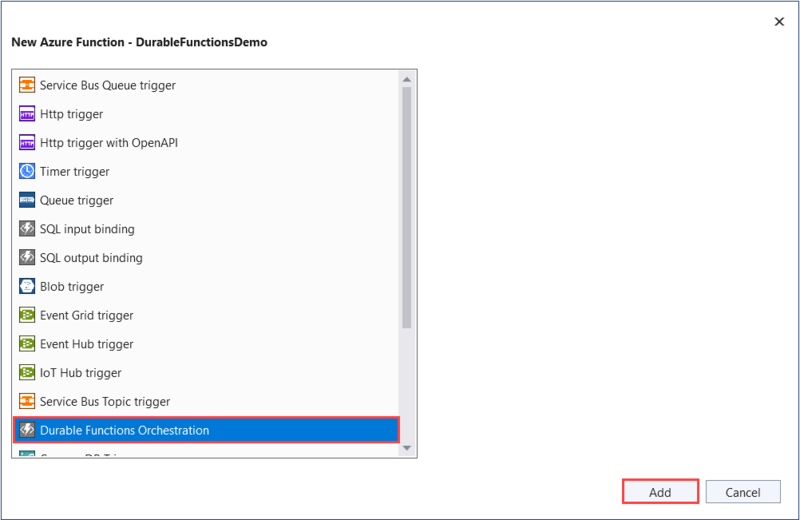 In the New Project dialog, select Installed, expand Visual C# > Cloud, select Azure Functions, type a Name for your project, and click OK. The function app name must be valid as a C# namespace, so don't use underscores, hyphens, or any other nonalphanumeric characters. (.NET Core) Creates a function project that uses the version 2.x runtime of Azure Functions, which supports .NET Core. Azure Functions 1.x supports the .NET Framework. 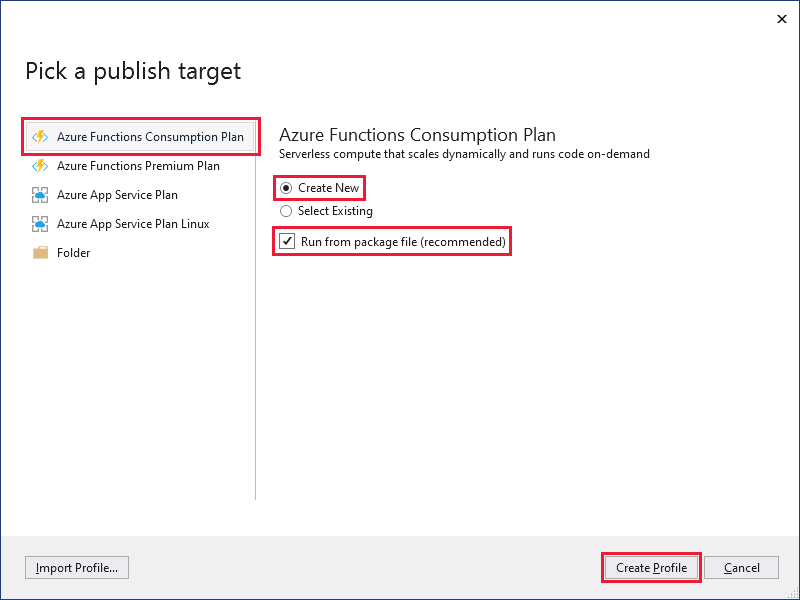 For more information, see How to target Azure Functions runtime version. Template Empty Creates an empty function app. Storage account Storage Emulator A storage account is required for durable function state management. Click OK to create an empty function project. This project has the basic configuration files needed to run your functions. The following steps use a template to create the durable function code in your project. Right-click the project in Visual Studio and select Add > New Azure Function. 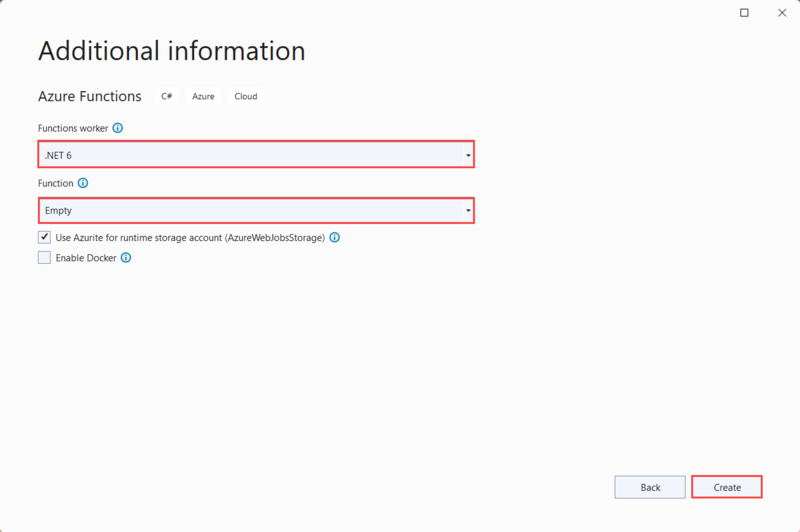 Verify Azure Function is selected from the add menu, and give your C# file a name. Press Add. RunOrchestrator <file-name> Manages the durable orchestration. In this case, the orchestration starts, creates a list, and adds the result of three functions calls to the list. When the three function calls are complete, it returns the list. SayHello <file-name>_Hello The function returns a hello. This is the function that contains the business logic that is being orchestrated. HttpStart <file-name>_HttpStart An HTTP-triggered function that starts an instance of the orchestration and returns a check status response. Now that you've created your function project and a durable function, you can test it on your local computer. The response is the initial result from the HTTP function letting us know the durable orchestration has started successfully. It is not yet the end result of the orchestration. The response includes a few useful URLs. For now, let's query the status of the orchestration. Copy the URL value for statusQueryGetUri and pasting it in the browser's address bar and execute the request. The request will query the orchestration instance for the status. You should get an eventual response that looks like the following. This shows us the instance has completed, and includes the outputs or results of the durable function. Copy the base URL of the function app from the Publish profile page. Replace the localhost:port portion of the URL you used when testing the function locally with the new base URL. Paste this new URL for the HTTP request into your browser's address bar. You should get the same status response as before when using the published app. 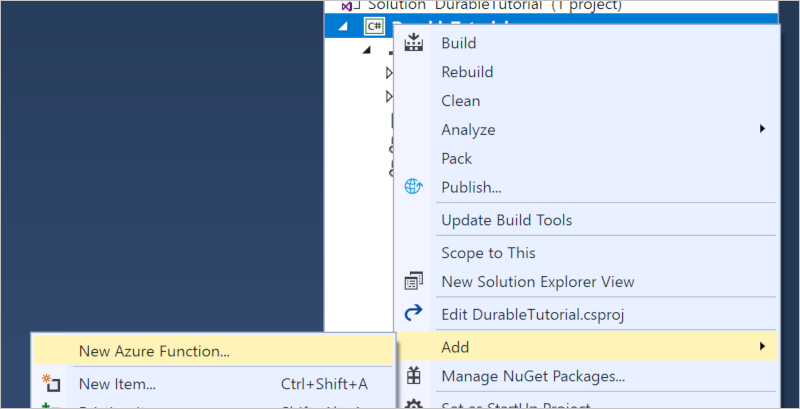 You have used Visual Studio to create and publish a C# durable function app. Learn about common durable function patterns.